OMNIA 8106, from TRIO Test & Measurement, is a 6-in-1 solution for performing AC Hipot, DC Hipot, Ground Bond, Insulation Resistance and Line Leakage tests. OMNIA 8106 is available with USB/RS-232 as a standard PC interface. Ethernet and GPIB are also available as optional PC interfaces. OMNIA 8106 electrical safety compliance testers feature some advanced like an intuitive menu system and graphic LCD for quick and easy test set-up and performance, as well as an exclusive prompt & hold function for accurately performing multiple steps within a test routine. 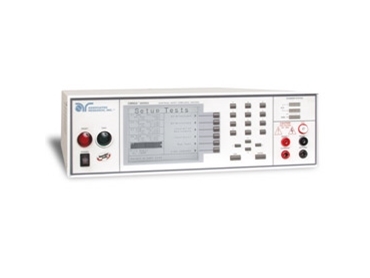 OMNIA 8106 electrical safety compliance testers also feature 50 test memories that allow for 30 test steps per memory and a cold resistance feature for line to neutral continuity testing. For efficient medical testing OMNIA 8106 also has the 7 most common measuring devices built-in to the tester. OMNIA 8106 electrical safety compliance testers are also compatible with the Autoware instrument control software. This allows for advanced PC control of the OMNIA 8106 electrical safety compliance testers. With Autoware, it is possible to automate testing procedures and increase the efficiency of a production line. Autoware allows for barcode scanning of serial and model numbers of the device under test. Autoware also provides instant access to test results. All test information is captured on a real-time basis and stored for analysis when needed. Test data can be viewed in detailed, summary or graphed formats.